Birds' B-Series Sport Suspension Kits for the BMW M135i and M140i consist of specially valved Bilstein shock absorbers and bespoke Eibach springs designed by Birds to offer the ultimate improvement in BMW ride quality and handling on the UK's diverse roads. This kit is exclusive to Birds, and the components are not available directly from the manufacturers. BMW chassis dynamics is an obsession at Birds. Primarily because we believe it plays the most crucial role in what makes a truly enjoyable and rewarding performance car, but also because we are always so disappointed with modern BMW suspension set ups. Not only is the ride quality very poor, particularly at the rear, but the cars demonstrate a real lack of composure and control when driving quickly on bumpy or undulating roads. Sudden changes of direction are common, along with a constant "jiggly" or "fidgety" sensation from the rear. The reason? Suspensions designed for German roads do not work very well on UK roads. To make things worse for us Brits, most current off-the-shelf aftermarket solutions 'designed for street' feel like the usual spine-jarring set ups that are actually designed for the Nürburgring. In the real world they handle poorly on UK roads, sometimes even worse than the standard set up, and do little to correct the real issues with the chassis. So, we gave up looking for a readily available solution. With the help of suspension experts and professional drivers, we took it upon ourselves to develop a suspension kit that handled beautifully on UK roads while improving the dreadful ride quality. After over 18 months of extensive development and testing, we released the final B-Series Sport Suspension kits for all current BMW 1, 2, 3, 4 Series models, inlcuding our favourites - the F20 M135i and M140i! The B-Series Sport Suspension kit is aimed at mature BMW owners looking for a faster, more compliant, and more comfortable road car set up. You will find our suspension to be a revelation, with corner exit speeds and traction massively improved, while also significantly improving ride quality. Importantly, we do not sacrifice practicality and performance for aesthetics. None of our kits lower the cars by more than 10mm, and are now only available in 'OE Black'. Here are some of the reviews of our F20 M135i, including comments on our B-Series Suspension kit. To see all editorials click here, and customer testimonials here. "Our M135i out-punches the M2 by 25bhp and 51lb ft of torque, so it feels stronger through the mid-range and more urgent near the redline. But with less power to deploy to the road, and wider tyres with which to do it, the M2 does have better traction..."
Follow Autocar's long-term M135i review online here, including details on our B1 upgrade development project and their thoughts on the results. The problem with the standard car. The M135i comes as standard with Drive Performance Control which provides a range of driving modes from Eco Pro through to Sport+. It can also be specified with electronically controlled adaptive M Sport dampers. The problem with the standard car is both the front to rear springs stiffness balance and the damping performance available from both the adaptive and standard shock absorbers. The more expensive adaptive dampers are designed to give the driver the option of how stiffly damped he wants the car to be at any given time. The Comfort mode gives soft damping all the way from slow speeds upwards. Most drivers are fishing for the "Sport" button just as soon as speeds increase beyond 60mph. Unfortunately, this immediately re-engages the traction control. The light may not come up on the dashboard, but that's because we believe BMW don't want you to literally see the results of pedalling the car too hard! So those cars not blessed with a mechanical limited-slip differential are immediately robbed of the additional control over the rear end and power delivery that these essential devices allow. Oddly, we believe that the standard dampers give a better account of themselves, especially at low and medium speeds, but they are cheaply made, and like the Adaptive Dampers have pretty much linear damping force curves measured against damper speed. There are also issues with the weight balance of the car. BMW’s obsession with “near 50/50 weight distribution” has led to heavy items such as fuel tanks and batteries being placed rearwards, often behind the rear axle centreline. What this achieves, under hard acceleration, is a significantly rear-heavy weight balance. One motor manufacturer has been battling the problems caused by excessive rear axle weight for over 50 years. Futhermore, if the rear tyres are pushed beyond the grip limit, this can cause the rear end to act like a pendulum. With an excessive rear end spring stiffness, the sudden break-away can be quite difficult to catch. Ultimately, what makes a car corner faster? There are three components to consider; the suspension components, the tyres (which are actually part of the suspension too), and the nut behind the steering wheel! In the correct combination, this will achieve the fastest possible cornering speed. But consider this - what makes the driver fast? It is confidence that the car will behave in a predictable manner up to, and even beyond the limit of grip. The way that the standard car can unpredictably throw itself around when covering bumpy roads is one of its major flaws. Once in a while, it's good to completely reset your expectations. If you don't you could remain entrenched, and not find the imagination to push the boundaries further. Since we started developing suspensions, we have already created some incredibly fine-handling and riding BMW cars. Our E92 3 series and E87/8 1 series chassis set-ups have received huge praise from the press and customers alike. We really didn't think we could improve matters very much. With the M135i, we utilised the data from the previous developments and recalculated according to the different characteristics of this similar chassis. The results were exactly as expected, although it took many attempts to iron out some issues not experienced in the previous chassis. Again, both press and customers found complete satisfaction in the results." Then, during a charity event track day, I was re-acquainted with James Weaver, the legendary Sports Car driver, who I first met way back in the late 1980s. He had a few comments to make about our Z4 35i which he was piloting, and some of them not altogether complimentary. He suggested that we contacted his chassis engineer friend and long-time work colleague, Peter Weston. So when our M235i demonstrator arrived, we set about adapting the M135i suspension configuration and installed it on the car. Results were as expected, but we then contacted Peter to see if there were any opportunities to make this even better. He requested that we give him measurement data from the car. I was astonished at the level of detail he required. Not only things like arm ratios, corner-weights, spring stiffness, damper rates and so on, but stuff that we'd never even started to consider, like un-sprung weights of each corner, centre of gravity above front and rear axles, bump stop stiffness and contact points etc. etc. The measuring work alone took us two full days. A few days later, he came back to us with two new spring and damper settings. We had Bilstein re-valve a set of dampers to Peters' "revision A" spec, installed them on the car, then he and James visited to test in early January. The weather was cold and damp, but nevertheless, after much fiddling with tyre pressures, front and rear geometry and different wheel and tyre sets, a conclusion was reached. There was no doubt that the car was behaving much better than our own calculated confection, but it was suggested that even more could be achieved in terms of ride quality and especially traction and grip levels with a 2nd "revision B". 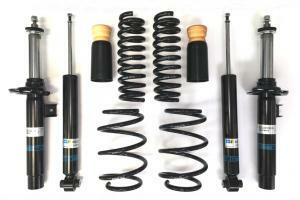 Bilstein shock absorbers are specially valved to Birds' own formula. This included changes to spring rates both front and rear, and damper curves to suit. Moreover, changes to the front track width (to generate less negative scrub radius)and, surprisingly, a different choice of tyre. Some 3 weeks passed whilst the revisions were manufactured and installed on the car. Although the changes seemed relatively minor to us, and left us wondering whether we would make miniscule gains at significant expense, the results were a revelation. Not only was the ride quality better than before, ultimate body control improved on our bumpy B roads, the steering feel improvements was in a different league. And the traction and grip levels? Simply unbelievable. Given the temperatures and conditions, we never expected to be able to assess that characteristic, but it's blindingly obvious that where we had so little before, now we have it everywhere. This is without doubt the best suspension tune we have achieved so far. So going back to the beginning, our expectations have been reset. The expectation being that a combination of revised spring rates, damper settings and anti-roll bars to a previously proven formula are enough to achieve the best possible result. No, the best possible result can only be achieved by continuing to accept that there is always room for improvement, and some of those gains may well be beyond ones' reasonable expectations. You cannot find without looking." Call us at Birds to arrange your demonstration on 01753 657 444.